Do you worry about traveling with pills today with all of the security requirements, the body scans, the pat downs? Let's clear up any worries you might have about traveling with your medications right now. What do you do about your pills and medications? Pills are not liquids and do not need to go in your zip-top plastic bag. I know… some medications are liquid. Those too can go outside of your plastic bag. We’ve addressed that below. That one quart/one liter plastic bag is for toothpaste, shampoo, sun lotion, insect repellant and other "non-medical" liquids. NOT in your checked luggage. That way you're sure to have them with you. There is just too much of a chance that your checked luggage might not arrive with you. You can live without a change of clothes for a day, but pills are important to have with you all the time. They go on to say, “We recommend, but do not require, that your medications be labeled to assist with the screening process." Does Traveling With Pills Mean Lots of Bottles? Option 1) If you absolutely, positively want to avoid problems, carry them in the original containers... even over the counter pills like aspirin. Prescription medications should have the pharmacy label with your name on them to absolutely avoid problems. Option 2) When it comes to packing medications, we generally dump all of our pills together into one container each, and we have never had a problem. We DO carry copies of our prescriptions… as in a written prescription from the doctor. That's a good idea for a couple of reasons. 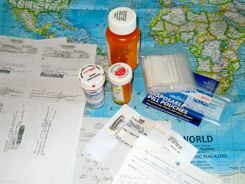 Second... if you lose your pills or you are delayed in your travels and need more, you may be able to get them with that prescription or show it to a local Doctor to get a local script written. We also peel the label off of the original pill bottle and carry that with us. Option 3) We have a friend who buys those small zip-lock pill bags at her local pharmacy… I bought some called “pill pockets”. She peels the pharmacy label off of the bottles and puts it on those little bags... They are more compact to pack than the bottles. So there's another option. Options 2 and 3 may sound like too much work to you, but we like to travel light, and this has worked for us. Our few pills are easy to tell apart. If it’s easier for you, go ahead and pack all the bottles. 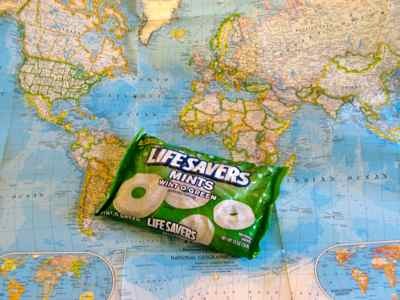 We haven't.... except for the time, years ago, in Africa when an overzealous customs agent wanted to know what kind of medication was in our "Lifesaver®™" candies. 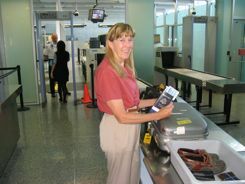 You will probably not have problems with security screenings on domestic flights or leaving a country. You are more apt to run into problems with customs if you are carrying large quantities of unmarked pills. If you are traveling with a "reasonable number" of pills, you shouldn't have problems here either. Remember they are trying to stop terrorists and smugglers, not ordinary travelers who need medication. Liquid medications are more confusing, but these too can go outside of your plastic bag. You may bring medically necessary liquids, medications and creams in excess of 3.4 ounces or 100 milliliters in your carry-on bag. Remove them from your carry-on bag to be screened separately from the rest of your belongings. You are not required to place your liquid medication in a plastic zip-top bag. This includes all prescriptions and over the counter medications including petroleum jelly, eye drops, and saline solution for medical purposes. I always take eye drops and saline outside of the plastic bag, and I’ve never had a problem at security. Whether you choose to use a pill organizer, dump your pills all together like we do, or carry them in their individual original containers, traveling with pills shouldn't be a problem if you travel with a reasonable amount. We cite the TSA, but airport security agencies throughout the world try to "harmonize" their regulations, so the rules should be similar. Check with your country's website for certainty. We just tried to simplify the rules... you should be OK.